Last weekend, my husband and I went camping with some friends at South Llano River State Park, near Junction, Texas. We hiked and fire-gazed and ate s'mores and herded children away from hot things and pointy things and things that might bite. We watched the sky fill up with stars and saw the Milky Way stretch itself across the dark. Then we watched it fade away again in the light of the three-quarter moon. Just before nine, moon glow, star light, and campfire flames all dimmed as a bright blue-green meteor lit up the sky on its descent through our atmosphere. At some point, I heard from my tent the mournful cry of my cell phone battery dying. It was music to my ears. I didn't write anything during our campout, but the smoke and the stars and the moon and the meteor all followed me home. They slipped into the poems I wrote on Sunday afternoon and curled up in the picture book draft that flowed from my fingers on Monday. I remember thinking, as I watched the meteor light up my campsite Saturday night, that it was a gift, a rare sighting that need not be taken for granted. But then again, wasn't the Milky Way a gift too? And the smell of wood smoke? And the cold air that snuck in between my layers of clothes? And the dead cell phone battery? And the moon? Wasn't the moon a gift too? Isn't it always? There are so many times when I sit at my desk, trying to force the ideas to come, attempting to wrangle words, kicking and screaming, onto my page or screen. Why do I do this when the world is full of gifts just waiting for me to notice them? All I have to do is step outside for a few minutes. Or read a poem. Or open a photo album. Or drive down a street I've never been on before. As writers, we have to make the most of the gifts we are given—a snippet of conversation, a dog rolling on his back in the grass, the taste of an unripe raspberry, the moon. The next time you're slouched over your desk trying to hog tie some poor piece into submission, take a break. Stand up. Turn around. Open your eyes. The world has a gift for you. 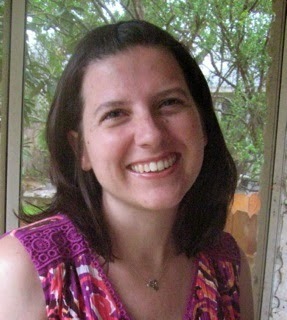 Carie Juettner is a poet and short story author living in Austin, Texas. Her work has appeared in over a dozen publications, including The Texas Poetry Calendar, di-verse-city, Dark Moon Digest, and WritersWeekly. Carie splits her writing time between her home office and her favorite Austin coffee shops. She has one husband and five pets, and she never leaves the house without at least a little bit of cat hair on her clothes for good luck. Her favorite color is purple. Follow Carie's blog at www.cariejuettner.com. Carrie--What a wonderful post. Your words inspired me with a post idea, so thank you. And by the way, I never leave home without some golden retriever hair--all over me. I completely agree with you! It is sometimes hard to write about anything humans might want to read if the writer never gets out and experiences life--good and bad. Thanks for this thought-provoking post. Why Is It So Much Fun to Write the Antagonist?